"This is the greatest food moment of my entire life. 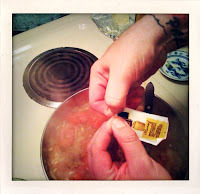 "- Friend and fellow stoner chef. So, this idea popped up a few months ago between me and a friend as we partook of some herb and brainstormed some "What if..." recipes ideas. Last Friday we piled up the ingredients and set out to create one of the ultimate stoner meals ever made. 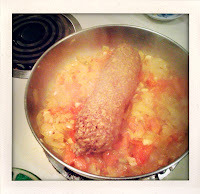 Now, we were going to make real cheeseburger samosas and vegetarian cheeseburger samosas, but we couldn't get our hands on any meat So...we got some fake Gimme Lean veggie sausage instead- a rich and satisfying substitute, although an entirely different creature all together. This can be oz for oz substituted for ground hamburger meat. Preheat oven to 375 F. Place butter in a large frying pan at medium heat. When the butter melts, add onions and stir for 3 minutes. Add garlic and banana peppers. Stir for 5 minutes. Add tomatoes and continue to stir for 5 minutes. 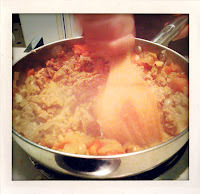 Then add the sausage. Break up the sausage and mix in with the veggies. Add mustard, chow chow and beer at this time. Let simmer until no liquid is left in the pan. Stir occasionally. While this is cooking, roll out the defrosted puff pastry (we forgot to defrost it so we had to massage it for about 15 minutes before it was workable), and cut and X into to create 4 triangles. Each triangle will be one individual samosa. 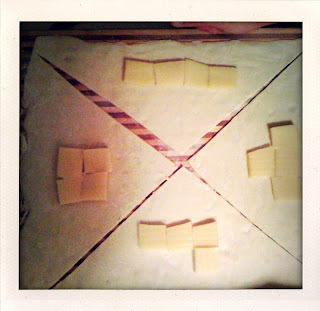 Place cheddar cheese on the puff pastry in Tetris shapes. condiments mixture on top of the cheese and add more cheese to the top. 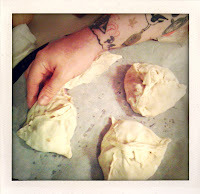 Fold up the 3 corners of the triangle and twist dough at the top. 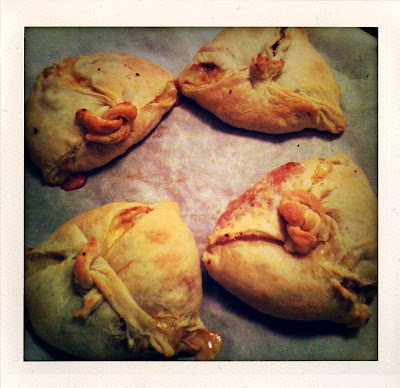 Pinch together the sides of the dough to enclose the filling as completely as possible. Place on parchment paper on a flat baking pan and bake in oven for approximately 15-20 minutes or until dough becomes a crispy golden brown. Serve and eat as you will.